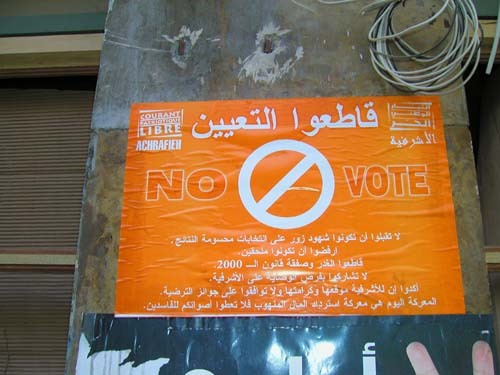 So the elections yesterday had an extremely low turnout (about 25% of voters in Beirut, and in some Christian neighborhoods more like 10%). So wild when you consider that over a million people cared enough about the political situation to turn out for several rallies just a few months ago. I think this has to do with the perception that it didn’t really matter who wins, it’s all business as usual. Also, Saad Hariri’s coalition was certain to win. There was very little campaigning, and even the coalition building was done via back room deals. Another huge reason for people to boycott, especially Christians, is that there are some very unfair election laws that are still in effect which strongly benefit pro-Syrian candidates (not unlike the Republican led gerrymandering that went on in Texas last year). Anyhow, it’s all very interesting. I’m heading to the Chouf Mountains today with Becky (an American anthropologist we’ve met) and a friend of hers. We are going to see Beitedinne Castle (lots of Ottoman art, I gather). You are currently browsing the Amy’s Journal weblog archives for May, 2005.